Hands down, one of my favorite things about the holiday season is the food. Is that superficial? Maybe, but momma loves her some sweets. And, while it's certainly not a license to cram 29 sugar cookies in my mouth at one time, this pregnant momma just passed my 28 week gestational diabetes test! If you remember, I had gestational diabetes during my pregnancy with HDawg, so it's really great that my body is responding properly this time around. You can read more about the GD here and here. Anyways, it's time to celebrate with some Christmas sugar, that's for sure. Let's start with an ah-maz-ing party mix recipe! 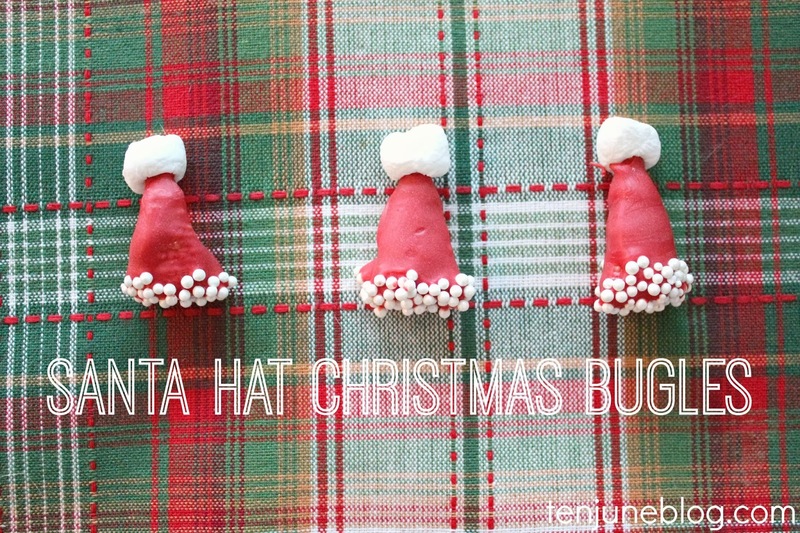 Step one is to create the adorable Santa hat Bugle snacks. I saw these little guys somewhere a couple of years ago and have been pining to recreate them for the last couple of Christmas seasons. Well, this is finally the year! I melted red candy discs (which you can get at your grocer or craft store) and simply dipped each individual Bugle snack into the melted candy. It took me awhile to get the hang of where to hold each piece as I dipped it, but I resolved to simply get messy and held each piece at the top point. Then I dipped the bottom of each hat in tiny white sprinkles. Here's my set up. 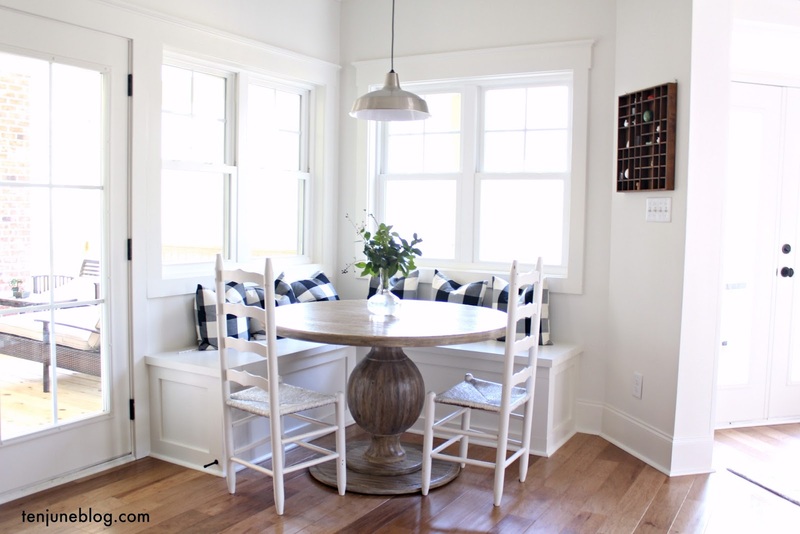 Place each wet hat on a piece of wax paper to dry. 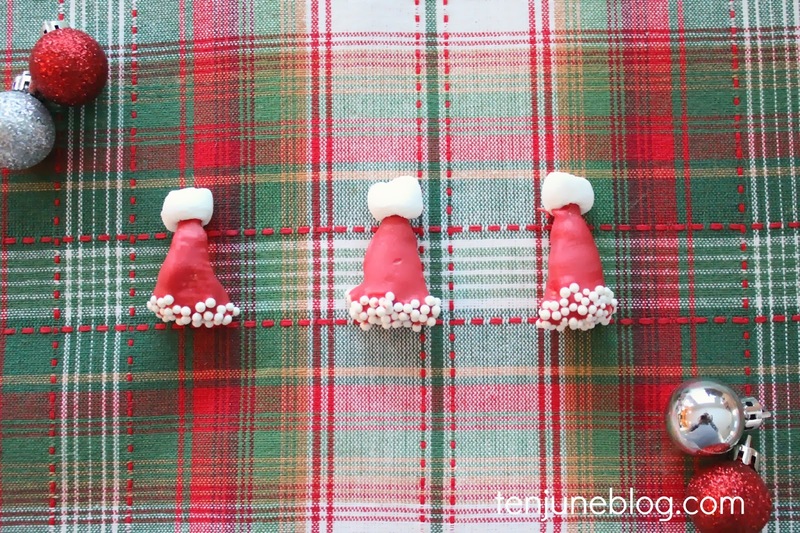 Once dry, pop a mini marshmellow on the top of each Bugle to complete the Santa hat look. 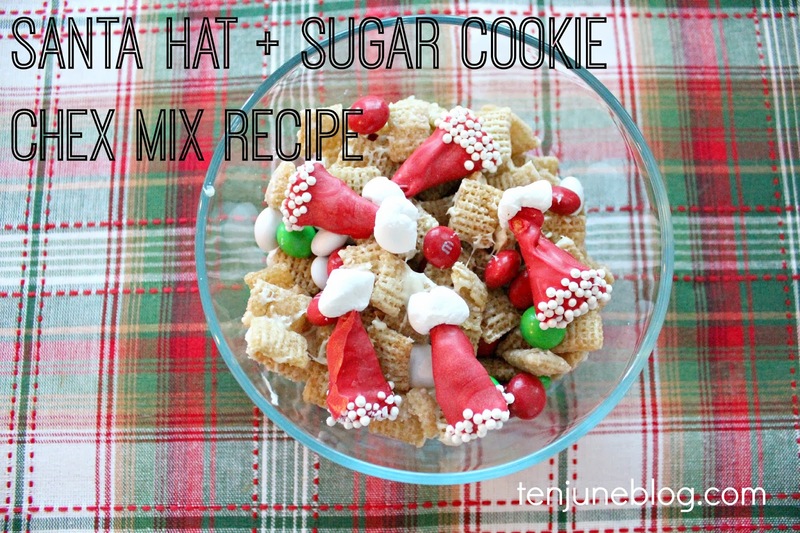 As for the rest of the party mix, I borrowed a recipe for a sugar cookie mix from the great folks over at Chex. I tweaked a few small things, though, so here's the process I followed. 1. Microwave butter until melted. Add sugar and corn syrup; microwave for thirty seconds until mixture is melted and can be stirred smoothly. Add vanilla to mixture. In a separate bowl, pour mix over cereal and stir until evenly coated. 2. Microwave entire mixture for two minutes. Sprinkle with powdered sugar and mix. 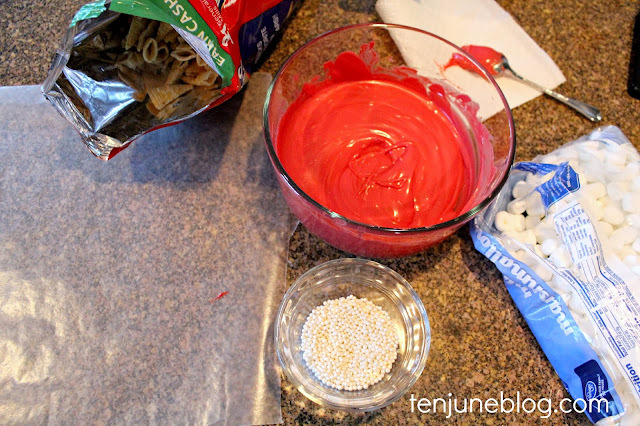 Spread entire mixture on wax paper to dry. 3. 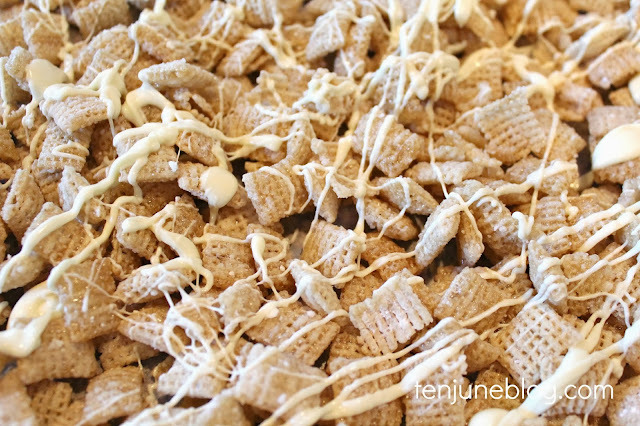 Melt white chocolate chips in microwave. Pour over cooling Chex mix. 4. Once cooled/dried, add the mix to a bowl and add M&M's and Santa hat Bugles. And now it's time to paaaarrty! And eat. Yum. It's also time to share your holiday recipes (food or cocktails!) with my girls Natasha and Heather! 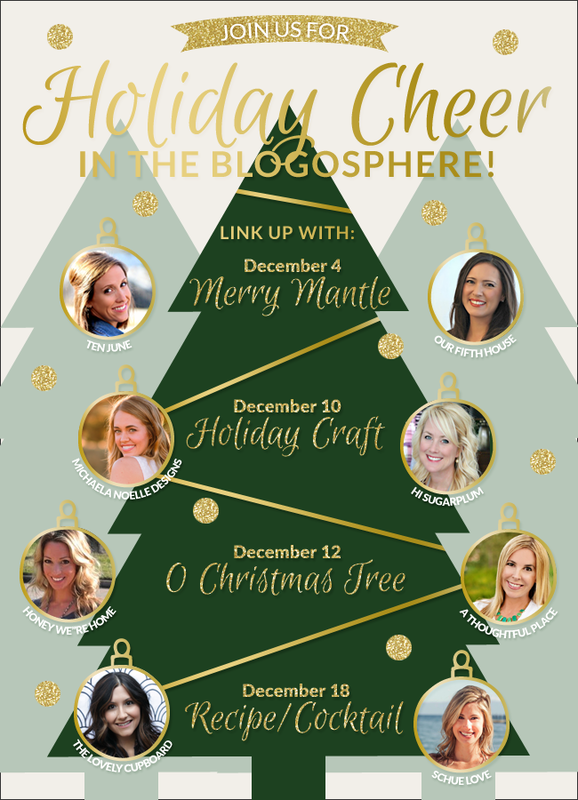 Make sure you head over to their blogs for some amazing Christmas recipe inspiration! 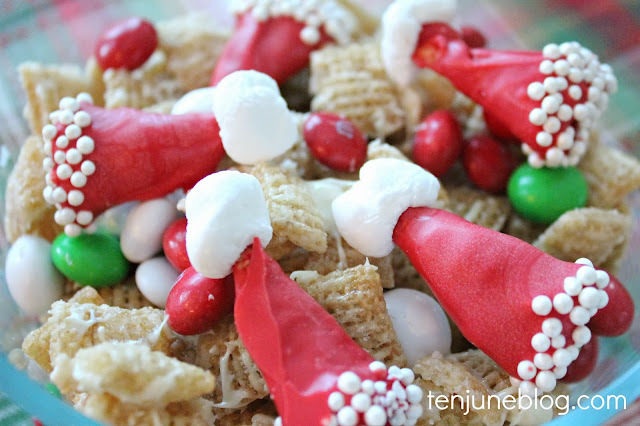 Pretty sure this is the perfect snack for the holidays and especially for the kiddos! Oh, aren't you clever? Flippin' adorable, Michelle! I LOVE this! So fun to have out in little bowls during a Christmas party! How cute is this?? Love it!!! Those are so cute! I used to love them as a kid! These are so adorable! 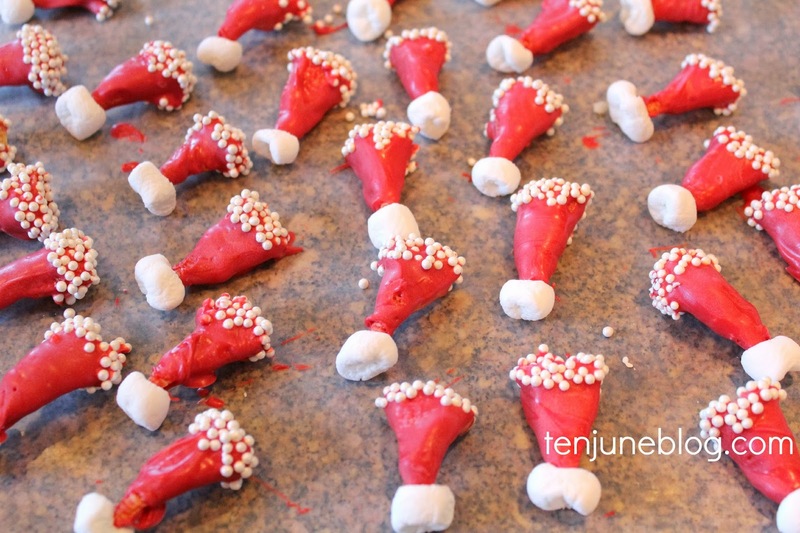 Great idea for Chrissy party food!! This is too cute!!! Newest follower! !